I need a well designed pitch deck, I know what I want it to say, and have a limited budget. I need a fully designed professional pitch deck, done right. Need content clean up. I need a full pitch deck, with extra slides, and plenty of time to perfect it. I need a much better pitch deck as soon as possible and I have a limited budget. FOR ALL DIFFERENT INDUSTRIES. IT'S ABOUT STORYTELLING.  Here at Pitch Deck Fire, we have extensive experience building clear, concise and compelling pitch decks that get results for our clients. As previous startup entrepreneurs, we know about business creation, development and growth. As talented designers, we are able to tell the story of your company in a visually appealing way, perfectly tailored to your particular needs and audience. Great pitch decks tell the story of your company, provide legitimacy and clarity to your message, and highlight the points that clients, investors, or accelerator programs need to see to invest. NEED CONTENT HELP? WE'VE GOT YOU COVERED! Not sure if you have the right information? We walk you through what we need from you to get the data points to back up your company’s pitch. We also write everything from scratch and will create editable graphs and charts from your detailed spreadsheets and financial information. Feel confident with your pitch deck expert throughout the project with scheduled calls, document shares, iterative feedback and revisions, and project timeline management. Need your deck really soon? Ask us how fast we can complete your project. Final deliverable is provided in a fully editable format, usually PowerPoint, and you retain full rights to use, edit or distribute in anyway you wish. Want to add some new slides? We are available to you for hourly pitch deck design work even after the project is closed. Over the years we’ve worked with clients from all over the world and in all different industries. They all have one thing in common, a stellar pitch deck of course! To read some testimonials or see more portfolio samples of our work, please visit our portfolio page. NEED YOUR PITCH DECK YESTERDAY? Need a pitch deck or sales presentation? Click to find out more! Need some help preparing for an upcoming pitch? Click to find out more! Need logo, branding or marketing collateral? Click to find out more! Need strategic support to get more customers? Click to find out more!